Having a killer body takes more than just beefing up your biceps and carving out a six-pack. If you really want to look and feel strong all over, you need to target your shoulders in a variety of different ways. Muscular, strong shoulders aren’t just visually impressive; they can also help improve your athletic performance in other areas, as well as prevent the most common types of injuries in the long run. Although we often think of the shoulder as one large muscle, it’s actually quite a bit more complex than that. While you might be able to get away with just doing curls if you want big biceps, it takes much more to build strong, healthy shoulders. That’s because the bicep largely is responsible for one movement (flexing the elbow), whereas there are a variety of different motions that the shoulder can perform and therefore many different ways to strengthen it. (This is also why shoulders are so much more prone to injury.) Choosing one shoulder muscle or motion and neglecting the others will not only get in the way of building the shoulders you want, it will also likely lead to imbalance and injury in the long run. As such, exercises for shoulders work best when there are a variety of motions involved. Think of the deltoid as being made up of three portions: There is an anterior head in the front, a middle or lateral head behind that, and a posterior head toward the back. When selecting exercises for your shoulders, you want to hit these three heads equally. The barbell shoulder press is probably one of the first exercises for shoulders that most people think of, and it does a good job of targeting the anterior head of the shoulder. To perform a shoulder press, stand with your feet about shoulder width apart and hold the bar at shoulder level in a grip slightly wider than your stance. Engage your back muscles to pull your shoulder blades together. Using your shoulder muscles, press the bar upward overhead. After you clear your head, push up and just a little bit back. At the end of your movement, you want the bar to be above the back of your head. Lower slowly back to your original position to complete one repetition. Dumbbell side raises are good exercises for your shoulders because they help to target the lateral head, which can sometimes be overpowered by the anterior head. To perform a side raise (or lateral raise), take two dumbbells in your hands and stand comfortably. Raise your arms out to the side, then lower them back down with control. Conventional wisdom says to only raise the weight to shoulder height to avoid rotator-cuff impingement. However, personal fitness coach Louie Brockhoeft feels that you can raise to about 45 degrees more than parallel safely if you turn your palms upward slightly on the way up and hold your arms slightly forward (between 10 and 15 degrees in front) instead of exactly at your side. There are a number of different ways to exercise the posterior head of the deltoid one good option is the bent over dumbbell rear deltoid raise with head on bench. To perform this exercise, take two dumbbells in your hands and bend over from the waist, resting your head on the tip of an inclined weight bench. Let your arms hang down toward the ground, then raise them slowly out to your sides, keeping your torso stationary. Pause for a moment at the top, then lower back down to complete one repetition. Having a well-defined trapezius can also help to give you the size and shape you desire. Because of this, shrugs are great shoulder exercises for men (and women, using smaller dumbbells). To perform this exercise, stand while holding a dumbbell in each hand. Shrug your shoulders up toward your ears to lift the weight. Hold for a moment, then lower to complete one repetition. Front raises or presses are great ways to work shoulder flexion. 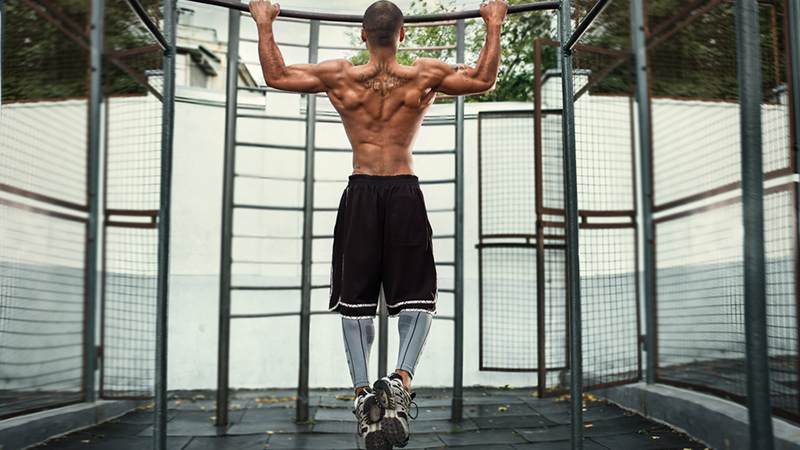 and shoulder extension can be worked by doing pull ups. For abduction, side raises are good, and adduction can be worked by wide grip pull-downs. For horizontal flexion and extension, try bench presses and seated rows. Internal and external rotation can be worked using cables or bands. As you perform exercises for your shoulders, exercise caution and stay within your limits. Avoiding injury and staying safe is the most important thing you can do while working out, and very good for your shoulders.